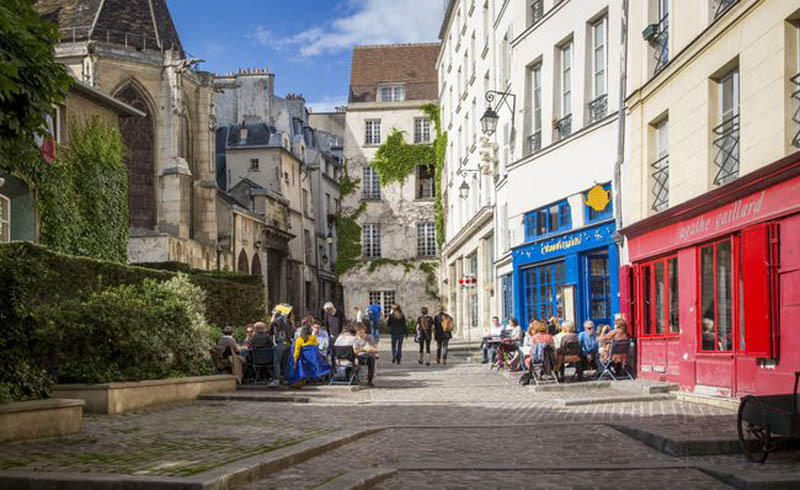 Paris houses many of history's more stunning spiritual relics—churches and cathedrals* that stand today as breathtaking testimonials to a complex heritage of Christianity that dominated in Paris from the fall of the Roman Empire to the French Revolution. Many of these majestic edifices fell into near-ruin in the wake of the Revolution but revived interest in the 19th century brought about their restoration. 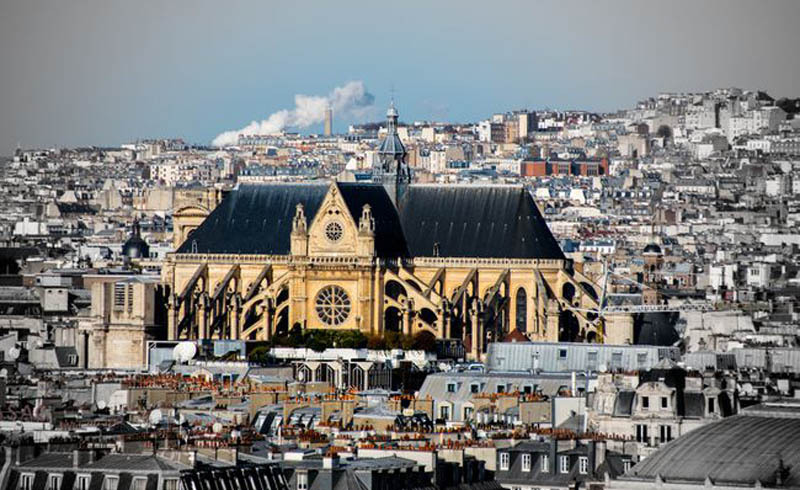 *Technically, Paris only has one true cathedral: Notre-Dame de Paris. 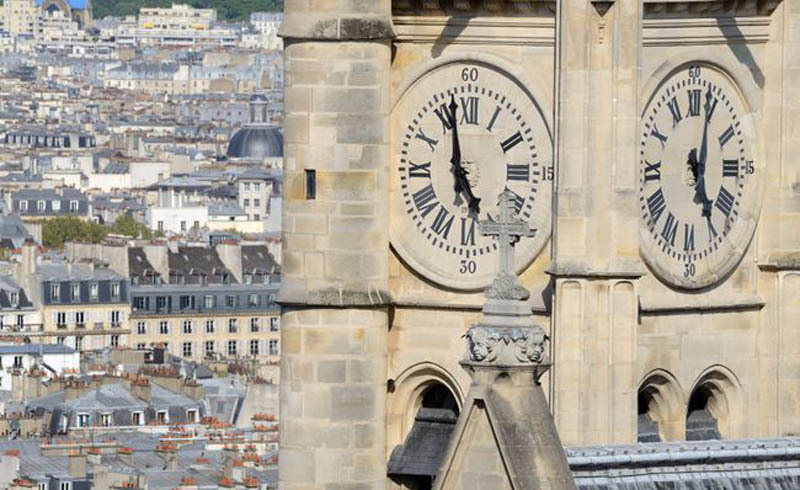 The others are either classified as churches or basilicas (both St-Denis and Sacre-Coeur are the latter). 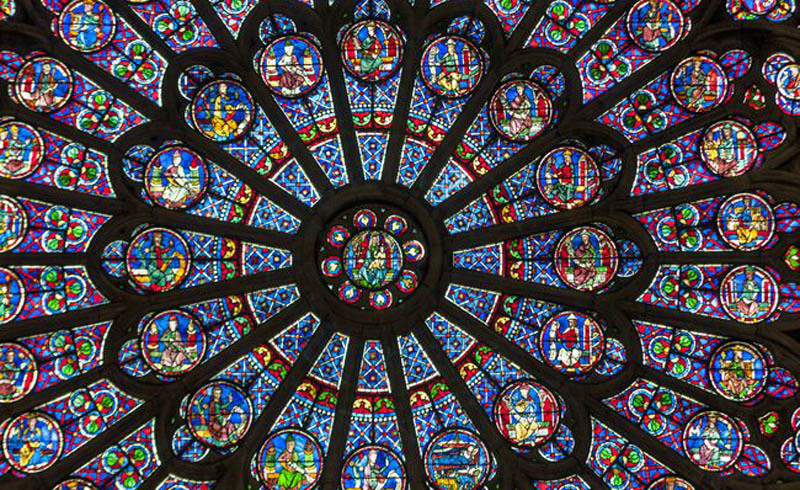 Notre Dame Cathedral is arguably the most stunning gothic cathedral in the world—and is undoubtedly the most famous. Conceived in the 12th century and completed in the 14th, Notre Dame Cathedral was the very heartbeat of medieval Paris. 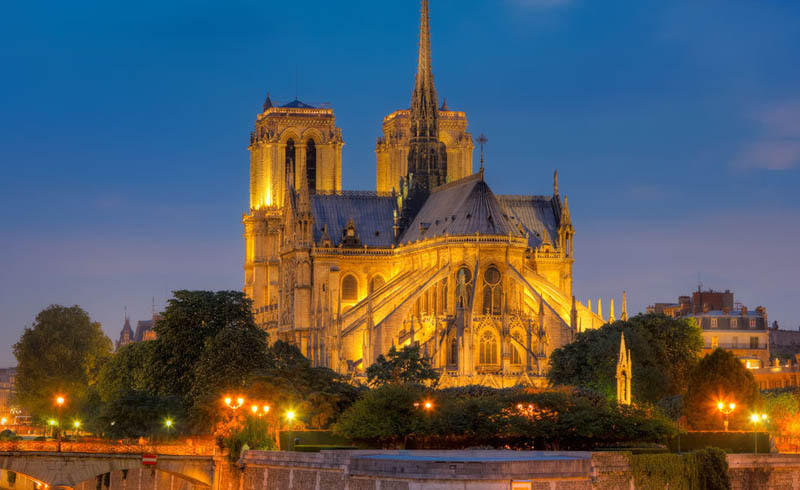 After a period of neglect, it recaptured the popular imagination when 19th-century writer Victor Hugo immortalized it in "The Hunchback of Notre Dame". Not far from Notre Dame on the Ile de la Cite looms another pinnacle of gothic architecture. 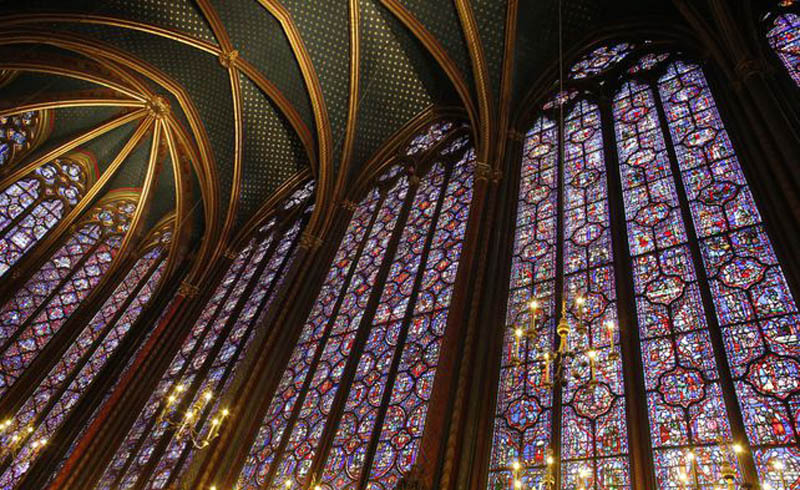 Sainte-Chapelle was erected in the mid-13th century by King Louis IX. The holy chapel features some of the period's best-conceived stained glass, housing a total of 15 glass panels and a prominent large window, whose colors remain surprisingly vibrant. Wall paintings and elaborate carvings emphasize the stunning medieval beauty of Sainte Chapelle even more. Just North of Paris in a working-class suburb is one of France's oldest sites of Christian worship and its most famous abbey—a burial place for 43 kings and 32 queens. The Saint-Denis Basilica, whose current edifice was built sometime between the 11th and 12th centuries, served as a royal burial site from as early as the 5th century. With its sculpted tombs and flamboyant gothic details, this often-overlooked gem is worth a trip outside the city limits. 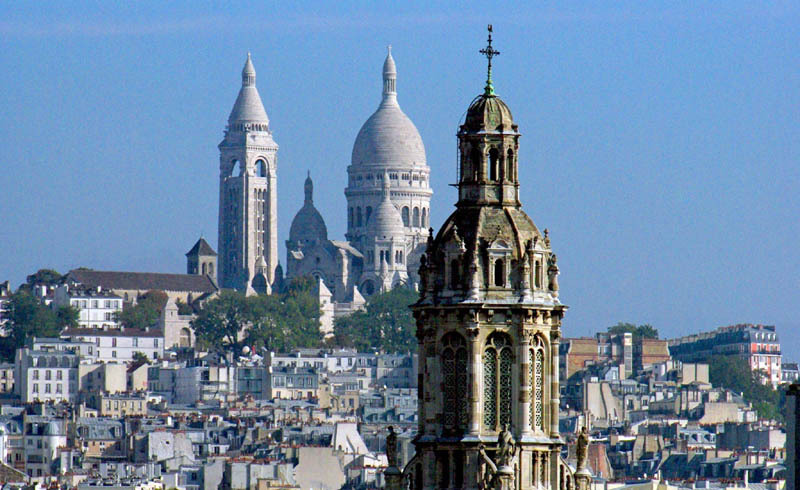 Dramatically crowning the heights of the Montmartre quarter, the Sacre Coeur Basilica is a relative newcomer to Paris. 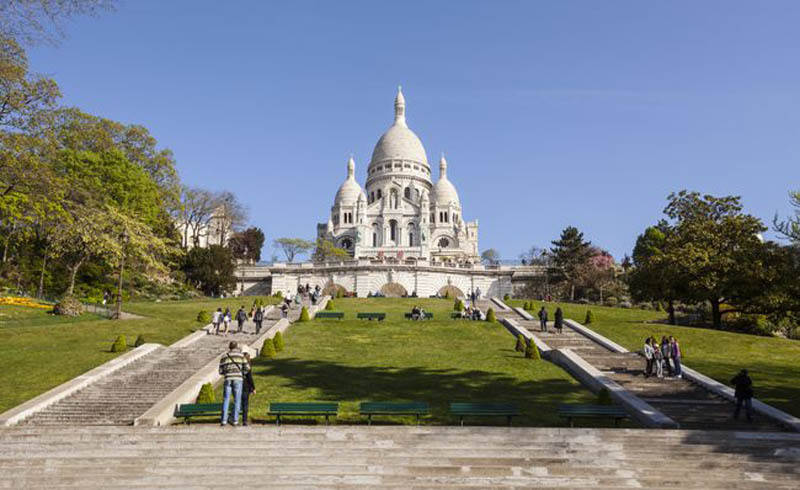 Built on the site of a Benedictine Abbey destroyed during the French Revolution of 1789, Sacre Coeur was completed in 1919, shortly after the close of the first world war. In contrast with the gothic style of Notre Dame or Sainte-Chapelle, the Sacre Coeur was built in a gaudy Romano-Byzantine style, and its interior is awash with gold leaf and other flamboyant decorative elements. Come here for breathtaking views of the city and for a glimpse of a very particular architectural model. This masterpiece of the French classical style saw its interior completed in the 17th century and its facade in the 18th and has become a popular tourist destination thanks to its central importance in the plot of Dan Brown's The Da Vinci Code. Highlights at the St.-Sulpice Church include wall paintings by Eugene Delacroix and a grand organ built by Cavaille-Coll, widely considered to be one of the greatest organ-builders of the 19th century. Built between 1532 and 1642, the Saint-Eustache church sits in the heart of the city, between Les Halles and the Rue Montorgueil district. On first glance, the church's facade closely resembles Notre Dame Cathedral, which makes sense since it shares its large transept. The eclectic design features both Renaissance-era decorative elements and a classic gothic design. Its unfinished appearance is oddly charming, yet many tourists completely overlook this interesting structure. The church's immense organ counts at least 8000 pipes and was used by musical luminaries including Franz Liszt and Berlioz to compose many of their key works. Concerts continue to be held regularly at the church to this day. Standing on one of the oldest medieval streets of Paris at Rue des Barres, the St-Gervais-St-Protais Church was completed in 1657, but a basilica was started on this site as early as the 6th century. Flamboyant Gothic and neoclassical design mingle in this eclectic church, which features the oldest organ in Paris (1601) and Flemish-style wood paintings. The chapel of the Virgin Mary houses a dramatic keystone. The church has also been the site of tragedy: On March 29, 1918, 100 people died here when German artillery pierced the roof of the Church. It was subsequently restored. 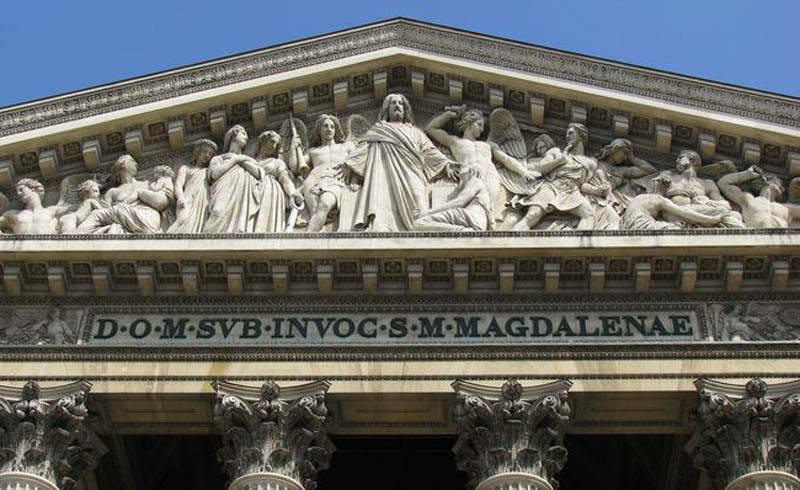 Curiously resembling the Parthenon in Athens, Greece, the Eglise de la Madeleine (named after Mary Magdalene) was originally slated to be a government hall, a library, and a National Bank. This was all before Napoleon I decided it should be a tribute to his army and Louis XVIII opted for its conversion into a church. The latter eventually got his way, and in 1842 the odd place of worship was consecrated. The ornate facade comprises 52 Corinthian columns supported by a decorative fresco. From the high steps of the Madeleine, magnificent views of the Invalides and the Obelisk at the Place de la Concorde can be seen. 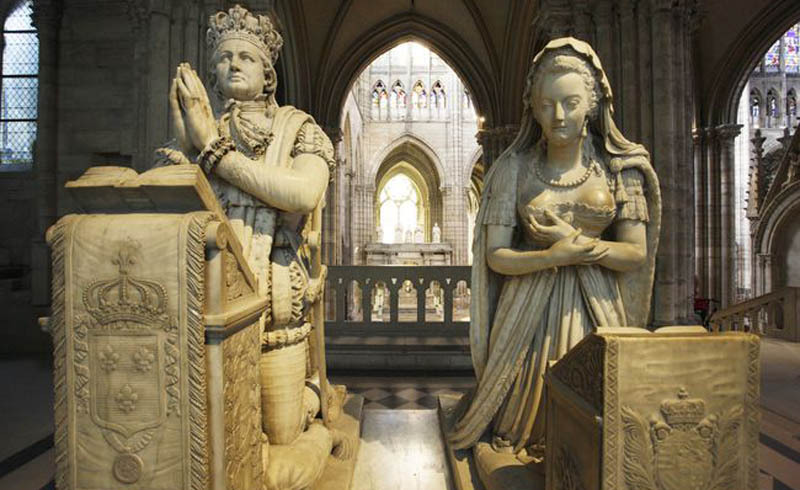 Inside, a remarkable statue of Joan of Arc is one notable highlight, as are paintings depicting the marriage of the Virgin and the baptism of the Christ child. 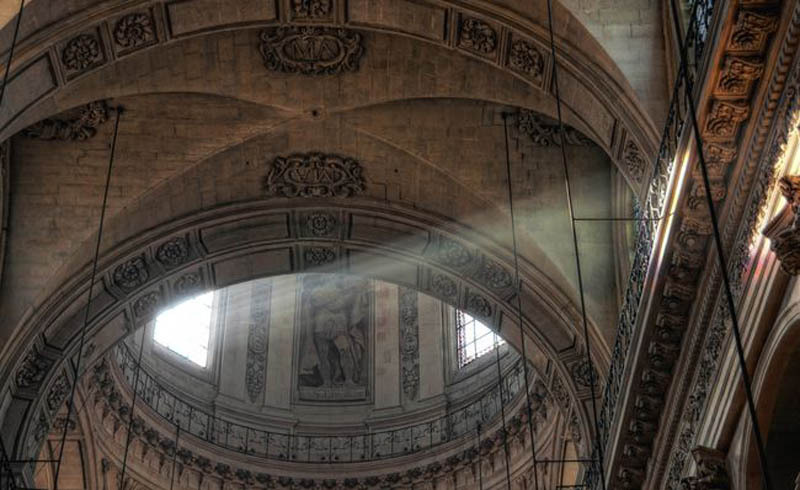 Tucked behind the vast mausoleum known as the Pantheon in Paris' legendary Latin Quarter, this church was originally erected in the 13th century but was rebuilt between the 15th and the 17th. Its facade comprises three superimposed pediments and a bell tower, while its highly luminous interior houses some of the city's oldest organs and well-preserved stained glass. 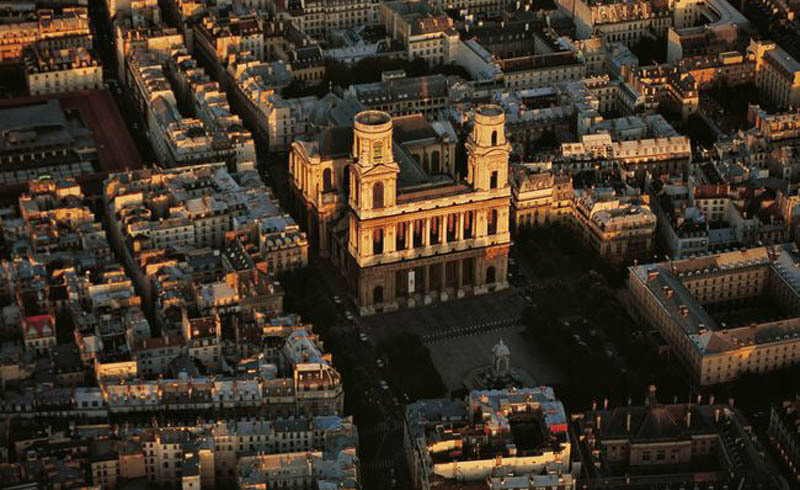 Commissioned by King Louis XIII and completed in 1641, the Saint-Paul-Saint-Louis church is one of the oldest, and finest, examples of Jesuit architecture in Paris. The Jesuit style features classical elements such as Corinthian pillars and heavy ornamentation. The church was pillaged and damaged during the French Revolution of 1789 when rebels stormed it and many other places of worship around the capital. Interestingly enough, St.-Paul-Saint-Louis briefly served as a "Temple of Reason" under the Revolutionary government, which banned the observation of traditional religion and religious practice. Though many artifacts were stolen from the church during the Revolution, some important works were spared. The most impressive is Delacroix' Christ in the Garden of Olives (1827), which can be seen near the entrance.